We are very familiar with Evernote in our school. Our staff collects, organizes and shares out student work in the form of digital portfolios with this application via iPads. Parents can see their son’s or daughter’s progress as it is happening. Our portfolio night in April has now become a Showcase Night. Evernote’s ability to easily capture images, audio, and text makes it a necessary tool for ongoing assessment, student reflection, and responsive instruction. But what about our own learning as professionals? Can the data and artifacts we collect help us become even more reflective about our practice? These are some of the questions we are trying to answer, in lieu of Wisconsin’s new Educator Effectiveness Plan. While teachers’ Student Learning Objectives will be measured by local and state quantitative assessments, the Professional Practice Goal is based more on qualitative data. I was introduced to the book The Reflective Educator’s Guide to Classroom Research: Learning to Teach and Teaching to Learn Through Practitioner Inquiry, 2nd Edition (Corwin, 2009) by Nancy Fitchman Dana and Diane Yendol-Hoppey from the Connected Coaching course I took last summer with Lani Ritter Hall. The authors provide a clear template of how teachers can become students of their own practice. They include several reasons for action research, such as being a powerful tool for professional development and expanding the knowledge of teaching in important ways. In addition, Dana and Yendol-Hoppey see action research as an important vehicle for raising teachers’ voices in education reform. “While both the process-product and qualitative research paradigms have generated valuable insights into the teaching and learning process, they have not included the voices of the people closest to the children – classroom teachers” (3). To measure one’s own practice and make improvements, several pieces of artifacts are needed to reflect on the day-to-day instruction. The authors offer several strategies for capturing our own instruction and student learning. The first strategy, Field Notes, involves scripting dialogue and conversations, recording questions the students and/or teacher asks, or noting what students are doing at particular time intervals. For scripting dialogue and conversations, I would use a Moleskine Evernote notebook. The advantage is, once you have scripted what you hear, you can scan in your notes into a specific Evernote notebook. Your handwriting is then readable if searching for specific terms. These notebooks can be assigned to a student, or to a subquestion from a teacher’s main wondering in their action research. The second idea from the authors when taking field notes is to have some sticky notes on your lanyard with a pen. If you want to capture student learning while teaching and don’t have a notebook around, write down what happened on the note. Evernote and Post-It have teamed up to create scannable stickies. 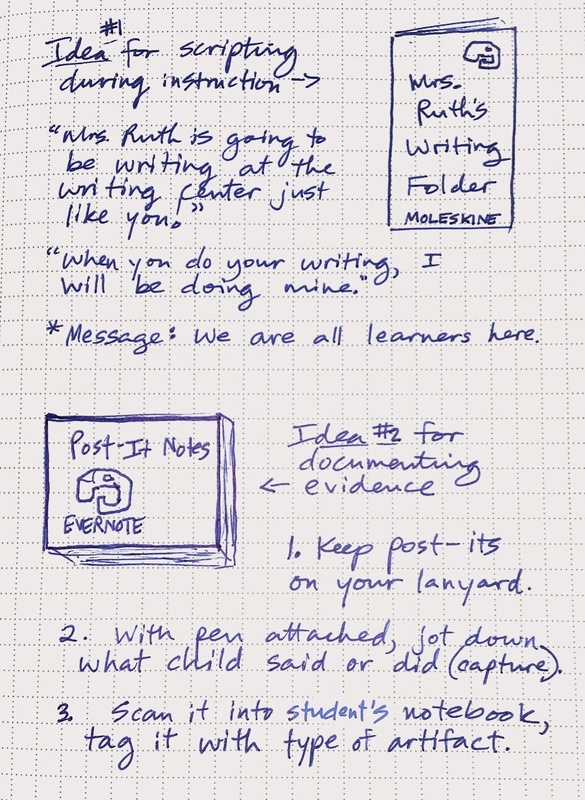 When using an iPad or iPhone, there is an option to take a picture of a Post-It Note within Evernote. Just like the Moleskine notebooks, what you write becomes readable and searchable. 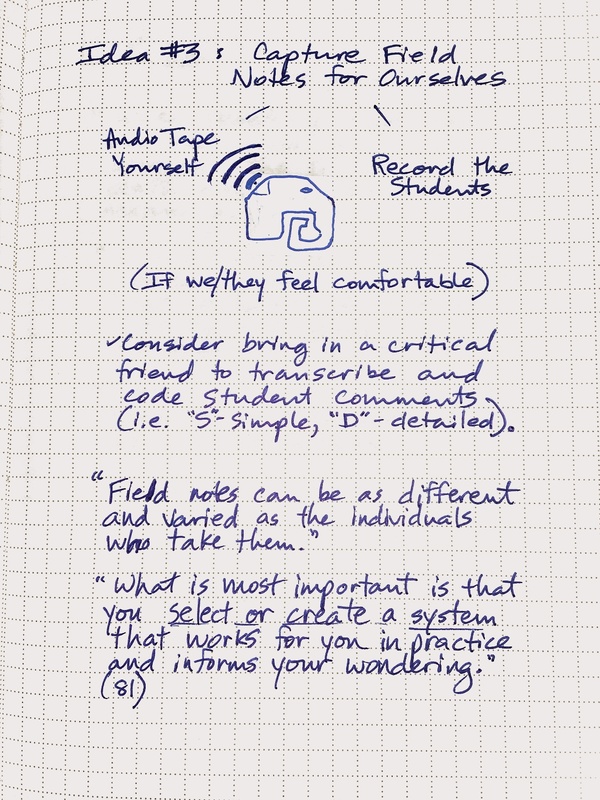 A final strategy for field notes is recording audio of students having a conversation and/or of yourself teaching. The authors recommend that whoever is being recorded is comfortable with the process. When this was written, iPads were not in the picture. That is why this tool, along with Evernote, can be so powerful. Students are very comfortable with these devices. Plus, the microphones are hidden. For a more comprehensive field note, a peer observer could record audio of student conversations, while he/she also scripted specific parts of the dialogue, such as coding the level of questions asked by each learner. How do you see technology such as Evernote augmenting action research in the classroom? Please share in the comments. Note: All notes derive from the aforementioned resource and were written in a Moleskine Evernote notebook. All doodles are from yours truly. Can a Principal Also Be a Coach? This is a question I continue to ponder, even after I have completed my Connected Coaching course through Powerful Learning Practice. The biggest issue I see is this: An administrator has to make evaluative decisions regarding staffing. This simple fact seems to lead me to believe that a principal can never truly be a coach. There is a line. In addition, in today’s political climate, how can a teacher truly take risks and embrace failure, when an attempt at innovation may lead educators to believe that it might lower students’ performance and incur instructional time lost? 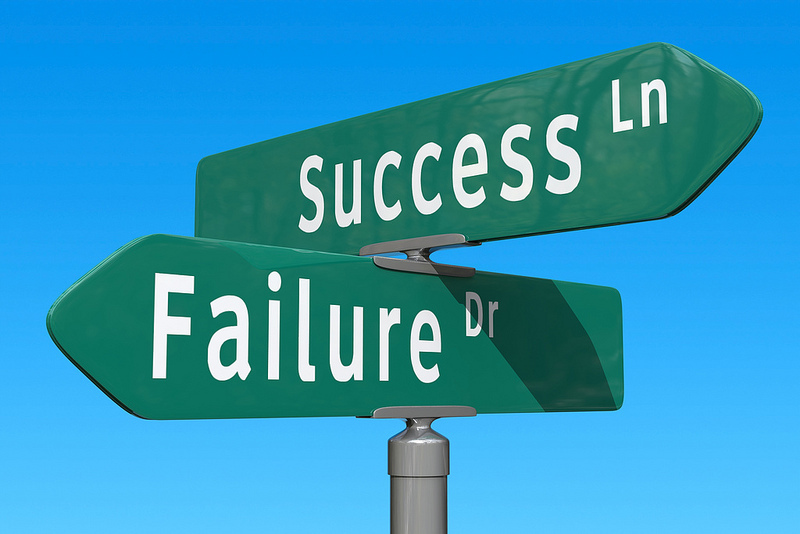 However, the paths of success and failure should not be two way streets. Maybe if principals take a coaching stance with their staff, innovation can flourish. Both teachers and students can be co-learners in their classrooms. I have my list of items to cover every fall with staff, along with a school kickoff that hopefully sets the tone for the rest of the school year. These are important building-wide activities. At the same time, we need to get to know each other as individuals in order to build trust and to show our creative sides. A six word story can allow everyone to express themselves and their passions in a nonthreatening way. This is the title of a great book on mindfulness by Jon Kabat-Zinn. The artwork is by my daughter. I used pixlr.com to create this image. For my teachers who all have iPads, I could see them using Skitch to share their six word stories with each other. I like to meet with each of my teachers in the beginning of the school year. We discuss their learning goals for the year, for themselves and their students. In the past I have prepared a list of questions to ask each teacher. Unfortunately, these conversations can become contrived, almost forced. With appreciative inquiry, it’s about focusing on the positive and helping the other person delve deeper into their own thinking. This sent a powerful message to me. Am I hearing everyone’s story? How is it integrated with what they as teachers do everyday in their classrooms? This comes back to being an active listener and respecting the process just as much as (or even more than) the product. The Wayfinding Model brings together 1) trust building, 2) questioning, and 3) facilitating design thinking (http://plpwiki.com/Wayfinding). I think every powerful practice needs a structure to support it, kind of like a coat hanger. What do we hang our many instructional hats on? So I come back to my original question: Can a principal also be a coach? Coming into this course, my answer was no. If students are experiencing a poor learning experience, no amount of coaching may remedy this situation. They deserve the best learning environment. I try to treat each situation as if my own son our daughter were in that classroom. Knowing what I know, would I stand for this? This simple question helps guide a lot of my decision-making. However, I also see the challenges of taking a multi-year process to ferret out poor performers. It can negatively affect both student learning and school climate. Dylan Wiliam, in his terrific book Embedded Formative Assessment, takes the approach that our time as school leaders is best spent helping every teacher become better at what they do. The students we have now deserve the very best we can offer today. Author Matt RenwickPosted on August 19, 2013 August 19, 2013 Categories Assessment, Celebration, Coaching, Leadership, principal as an advocate, ReflectionTags connected coaching, lani ritter hall, PLP, principalship, wayfinding11 Comments on Can a Principal Also Be a Coach?